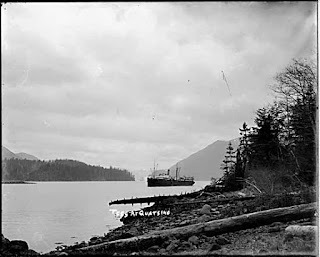 Canadian Pacific Railway steamer the Tees, entering Quatsino Sound in the early 1900s. For most of the last 150 years, the main method of transport around the Northern Vancouver Island was by ship. The Canadian Pacific Railway's fleet of steamers were a lifeline and a highway for coastal communities. Built in 1893 in England, the steamer Tees was first used to transport gold prospectors back and forth to Alaska. In 1903 she was reassigned to the West Coast of Vancouver Island, a route which she plied until 1913 when she was replaced by the Princess Maquinna.